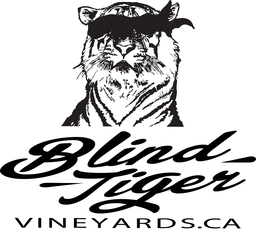 Owned and operated by Jerry and Charlene Wowchuk since 2007 and sitting on the ridge between the villages of Okanagan Centre and Winfield in Lake Country, British Columbia, Blind Tiger planted their vineyard in 2010. With mature blocks of Riesling and Gewürztraminer, a block of Pinot Noir entering its second season, as well as Pinot Noir and Chardonnay, Blind Tiger’s on-site operation includes approximately 3.5 planted acres expected to produce approximately 14 tons of grapes annually at full capacity. Blind Tiger is inspired by organic principles and received its Organic Certification from the North Okanagan Organic Association in 2013. The vineyard's philosophy is to make high quality wine with as little chemical intervention as possible. Natural compost fertilizers are used to maintain ideal soil nutrient profiles, sulfur is used to control fungus on developing berries, and a flock of organic heritage chickens roams the rows performing pest control duties. The winery is open daily Mon - Thurs 11:00 - 5:00 and Fri - Sun 11:00 - 6:00. Marno's woodfire pizza available for lunch (11am - 3pm Tuesday through Sunday) and dinner (Friday through Sunday only).